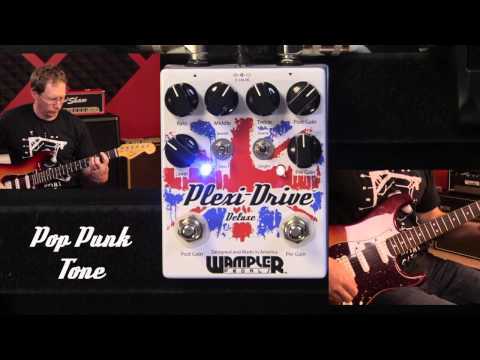 Delivering the powerful Plexi Overdrive sound of the 60s used by the likes of Jimi Hendrix, Led Zeppelin, Cream, and AC/DC, the Wampler Plexi Drive British Overdrive Pedal brings legendary tone to a whole new generation to enjoy. The Plexi Drive contains modern technology but stays true to traditional sound, all in a rock-solid unit. This deluxe version also features separate switches for post-gain and pre-gain modes, additional treble and mid control and independently adjustable pre and post gain amount. The Plexi Drive features many controls for gain, volume and tone so that straight off the bat, you can tweak the tone to get your desired sound, no matter what your rig or venue. You can emulate tones from 18-watt Marshall tones to the all out massive rock tones of a JTM-45! Thanks to the post and pre gain modes, you can drastically change the sound with just a click of the switch. For that extra whack, the Plexi Drive also comes with an additional Bass switch to give you a huge 4x12" cabinet characteristic boost to help you thunder out across the mix. Designed to be worked hard, the Wampler Plexi Drive Deluxe comes encased in a metal chassis that will keep the intricate workings safe from harm, no matter how you stomp. For times when the Plexi Drive isn't in use, true bypass technology ensures your signal will be blemish free. For classic British stack overdrive, the Wampler Plexi Drive Deluxe British Overdrive Pedal is a front-runner and manages to deliver incredible tone in a small unit that would be another superb jewel to add to your pedalboard crown.